Are you talented and passionate about change? If so then help shape the future with a Siemens Apprenticeship. 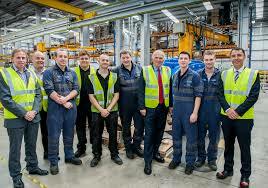 Siemens currently has over 500 apprentices working for them and YOU could be one of them! You’ll be a valued member of the team at Siemens and can even go on to secure a full time position at Siemens once you’ve completed your Apprenticeship. An Apprenticeship with Siemens combines studying and hands on training where you’ll gain a wealth of experience, a professional skill set and an abundance of knowledge plus a nationally recognised qualification in your chosen discipline. There are two levels of qualifications that you can study at Siemens, advanced and higher. Whether your interest lies within business, engineering or even finance, there are plenty of opportunities for you at Siemens. You’ll have the chance to work in a diverse role. Siemens make products such as traffic lights, industrial gas turbines and help keep train networks running efficiently as well as creating methods for cleaner energy. It’s such an exciting environment to be a part of with so much going on and that’s just in the UK alone. Siemens have numerous sites across the UK. You could be based in Congleton, Manchester, Leeds, Newcastle, Lincoln, London, Ulverston, Northampton or Poole. Depending on your qualification level, requirements vary. If you’re looking at doing an an advanced apprenticeship should have a minimum of four GCSEs or equivalent at grade C or above including Maths, English, Science. If you’re seeking a higher Apprenticeship, you should have A Levels in relevant disciplines or equivalent. Ready to apply? Use the links listed below to secure your dream position at Siemens.